The Fabric Garden offers in-store financing through Synchrony Financial on select Janome purchases. Credit decision is typically in minutes. Stop into our shop in Madison, Maine for more information or to fill out an application, and take your dream machine home today! Based on credit approval. Subject to credit approval. **Valid on single‐receipt Janome America Product purchases exceeding $3,000 made with the Sewing and More Credit Card between 3/7/2019 and 3/14/2019. No interest will be charged on promo purchase and equal monthly payments are required equal to initial promo purchase amount divided equally by the number of months in the promo period until promo is paid in full. The equal monthly payment will be rounded to the next highest whole dollar and may be higher than the minimum payment that would be required if the purchase was a non‐promotional purchase. Regular account terms apply to non‐promotional purchases. For new accounts: Purchase APR is 29.99%; Minimum Interest charge is $2. Existing cardholders should see their credit card agreement for their applicable terms. Subject to credit approval. Subject to credit approval. *Valid on purchase of Janome America Products exceeding $150 on a Synchrony Financial account. Equal Monthly payments are required equal to 1/6 of the total sale during promotional period. Interest accrues during promotional period and will be assessed if promotional purchase balance not paid in full within promotional period. *No Interest if Paid in Full within 6 Months on Janome America Purchases of $150 or more with your Synchrony Financial card.. Interest will be charged to your account from the purchase date if the promotional balance, including optional charges, is not paid in full within 6 Months or if you make a late payment. Equal Monthly Payments Required. Offer applies only to single-receipt qualifying purchases. 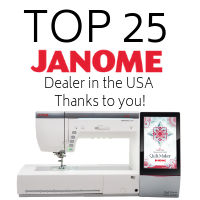 Valid on purchases of Janome America products of $150 or more on Synchrony Financial account. If promo and debt cancellation are not paid in full within 6 Months, interest at APR 29.99% will be assessed from purchase date. If account goes 60 days past due, promo may be terminated early and accrued interest will be billed. The equal monthly payment will be rounded to the next highest whole dollar and may be higher than the minimum payment that would be required if the purchase was a non-promotional purchase. Regular account terms apply to non-promotional purchases. As of 1/1/1/2013, Purchase APR 29.99%; Penalty APR 29.99%. Minimum Interest $2. Subject to credit approval. Subject to credit approval. *Valid on purchase of Janome America Products exceeding $1,000 on a Synchrony Financial account. Equal Monthly payments are required equal to 1/12 of the total sale during promotional period. Interest accrues during promotional period and will be assessed if promotional purchase balance not paid in full within promotional period. *No Interest if Paid in Full within 12 Months on Janome America Purchases of $1,000 or more with your Synchrony Financial credit card. Interest will be charged to your account from the purchase date if the promotional balance, including optional charges, is not paid in full within 12 Months or if you make a late payment. Equal Monthly Payments Required. Offer applies only to single-receipt qualifying purchases. Valid on purchases of Janome America products of $1,000 or more on Synchrony Financial account. If promo and debt cancellation are not paid in full within 12 Months, interest at APR 29.99% will be assessed from purchase date. If account goes 60 days past due, promo may be terminated early and accrued interest will be billed. The equal monthly payment will be rounded to the next highest whole dollar and may be higher than the minimum payment that would be required if the purchase was a non-promotional purchase. Regular account terms apply to non-promotional purchases. As of 1/1/1/2013, Purchase APR 29.99%; Penalty APR 29.99%. Minimum Interest $2. Subject to credit approval.